Extra Large Double Sided Hanging Sign - - town home multi unit sign, condominium community multi home sign, and multi unit office sign. Large format 18"W x 23.5"H personalized hanging two sided address sign. The same personalization appears on both sides. Made in the USA. For two numbers, three numbers, four numbers, five numbers, or six numbers. Shown here with 4 address numbers and last line Private. Arch top 23.5" high sign hangs vertically. Large facility signage is ideal for multi-unit residential and business locations such as office parks and townhouse communities. Holds up to six lines of personalization visible to customers, clients, employees & contractors, and delivery drivers, etc. approaching from either direction. Sign is ready to hang from your bracket and post. Two 3/8" hanging holes on 15" centers are reinforced with two solid brass grommets. We also provide two stainless steel S hooks for attaching the sign to your chain or fixture. Vertical orientation: 23.5" tall x 18" wide. Made from sturdy, UV-stabilized, non-rusting laminated acrylic with engraved personalization. This custom address plaque can be manufactured with up to six lines of personalization. Character size ranges from 2" to 5" depending on character count. For example, the five-line sample sign holds four lines of 3" numbers and one line of smaller 2" letters. Six lines of 2" characters with up to nine (9) characters per line. Five lines of 3" characters with up to six (6) characters per line. Four lines of 4" characters with up to five (5) characters per line. Three lines of 5" characters with up to four (4) characters per line. If you are not using all six lines for your sign, please leave the extra input boxes empty. Dimensions: 18"W x 23.55"H x 1/8". Comfort House P2390 (style CAH1824). Also referred to as our multi unit address plaque. Extra large, vertical hanging sign. Laminated acrylic construction. 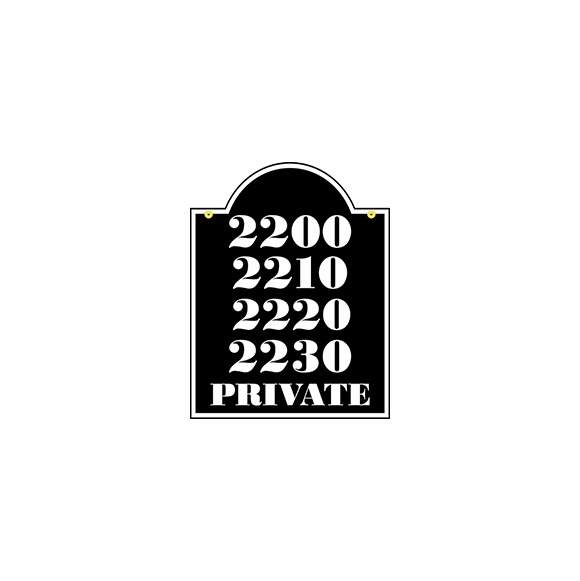 Two side address plaque made in America by skilled artisans to assure the highest quality.